As everyone knows, one of the objectives of Social CRM is to engage customers, and turn them into brand advocates. As I’m English, being unreservedly positive about anything is not something that comes naturally to me, but despite that I am an unashamed brand advocate for Spotify; it has transformed the way I listen to music. For £10 a month, if I hear about a band I’m interested in I can go and listen to their entire back catalogue without the cost of buying it from Amazon, the even greater cost of buying it from iTunes, or the guilt-trip of Bittorrent. Has it broadened my musical tastes? Probably not. At the risk of showing my age and terminal unhipness, I really couldn’t give a proverbial rodent’s backside about the new Lady Gaga album, however cheaply Amazon try to sell it for. No, for me, the musical event of the year will be the IQ 30th Anniversary show in Leamington Spa in June. So, pity us prog-rock dinosaurs who suffer most for Spotify’s ongoing omission from some albums of tracks that are longer than 10 minutes. What’s the point of even having Dire Straits’ Love Over Gold on Spotify without Telegraph Road? On Spotify’s forums (“This is the official Spotify support forum. Spotify employees are active here”), this topic has been discussed over the last 7 months without a resolution. There have been occasional contributions from Spotify employees acknowledging the problem, explaining the situation and apologising for the delay. But the last of these was two months ago, and frustration is building. This is arguably worse than, say, Apple’s policy of deafening silence; at least everyone knows Apple aren’t going to answer on their forums. 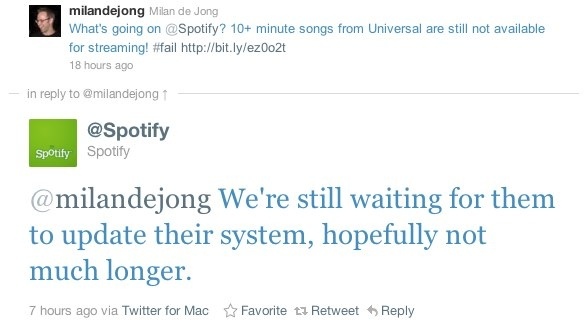 But on Spotify’s, we keep hoping for an official reply. What brought this sharply into focus for me is that some of the forum contributors decided to move their complaints to Twitter, and one of them got a reply within hours. OK, it’s not a solution, but after two months of silence, it’s better than nothing. We all know how it important it is to keep customers informed. What does this say? Do Spotify listen more actively on Twitter than their on own forums? If Spotify users knew that, would they simply abandon the forums and send everything through Twitter? Probably. The forums would become purely user-to-user, like Apple’s. But as long as a company says “our employees are active here”, it’s crucial that they really are active. If you saying you’re going to listen, then make sure you do, and make sure your customers realise you do.